I'll be in NYC this summer, I hope it will still be going. If we decide on an MI6 meet up beforehand I'll fly out! I wish i could go see it but i won't be going to New York anytime soon. I went to see the Designing 007 : Fifty Years of Bond Style exhibition in Melbourne which was fantastic, a few years ago. I'm absolutely kicking myself for not flying down to Melbourne for weekend and seeing it. I live in Melbourne so it was no problem for me. It was amazing, it's a shame you didn't see it. What's New York like as a holiday destination ? What i've seen of it on tv and movies it looks boring. Full of skyscrapers, taxi's and nothing else. People who've been there tell me they liked it. Pretty magical, been there many times during the holidays. Just one of those cities. It's an awesome place, IMO. Hope I'm able to catch Spyscape next time I'm there. I just go because I'm from near there and have friends. Midtown Manhattan does do it up for the Holidays. Winter there is awfully cold apparently and i hate the cold weather. And one day it's 32 the next day it's 15 in summer. I also lived in LA for many years. No comparison. LA was a fun life, I guess, but it pales before the glory of NYC. But yes, it's cold. Worse Upstate, where I went to high school and college. I have to get to Melbourne. This will be the first James Bond exhibition ever held in New York City. Anybody remember this in 1987? https://www.moma.org/calendar/exhibitions/2171? The first official James Bond exhibition in New York will open on March 8th, 2019 at SPYSCAPE in Midtown Manhattan. ' 007 x SPYSCAPE: DRIVEN' will allow fans to discover the world of 007 from a new perspective through a multi-sensory experience that explores the creative process behind the 007 movies, while revealing the secrets of James Bond's iconic Aston Martin DB5. Arrival Tunnel - Uses light and music to draw you into the world of 007. Immersion Room - Inspired by the title sequence of Goldfinger (1964), designed by Robert Brownjohn, this rich immersive space uses an evocative soundscape and sophisticated projection mapping onto a sculptural installation to transport you into a dreamlike Bond environment. Q Briefing - Introducing the Aston Martin DB5 as first seen on screen. Q Workshop - Step inside a contemporary evocation of Q's workshop and come face to face with Bond's Aston Martin DB5. The beloved silver birch beauty takes centerstage amidst a workshop filled with plans, designs and celebrated gadgets from Q and his team. Ken Adam Studio - A studio for the legendary Sir Ken Adam, the Oscar®-winning Production Designer responsible for some of the most memorable 007 sets, vehicles and gadgets, features original sketches. You will see drawings come to life and hear Sir Ken tell the story of his creative career in his own words. Production Studio - Go behind the scenes of the explosive moment in Skyfall when the malevolent Silva (Javier Bardem) orders his helicopter gunship to destroy first Bond's DB5 and then his ancestral home. Walking into the studio you'll see a 1/3 scale model of Skyfall Lodge and the actual 1/3 scale burned out car from the film. Key members of the production team explain the thinking behind the destruction of the Lodge and the DB5. Screening Room - a unique new compilation of memorable Bond moments with his beloved DB5. Exit Tunnel - A specially commissioned soundscape, featuring the main Bond theme, leads you from the immersive exhibition to exit through the gift shop! Seems interesting. One of our local (NYC) TV stations did a short piece on it during today’s (3/12/2019) morning news. I definitely going to see it at some point – just don’t know when yet. 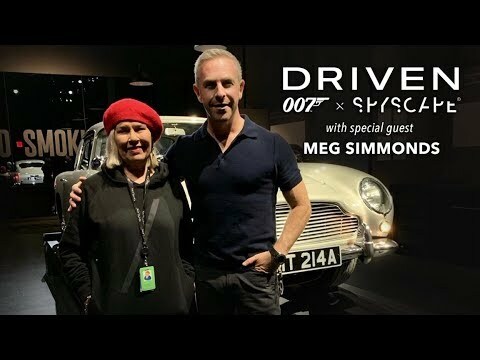 David Zaritsky of TheBondExperience and friends from AJB and MI6Community getting a guided tour of DRIVEN: 007 x SPYSCAPE with Meg Simmonds, EON's Archivist. Some of the exhibit has been left out of the video to retain the element of surprise.